Their defensive errors cost the Angels important three points. 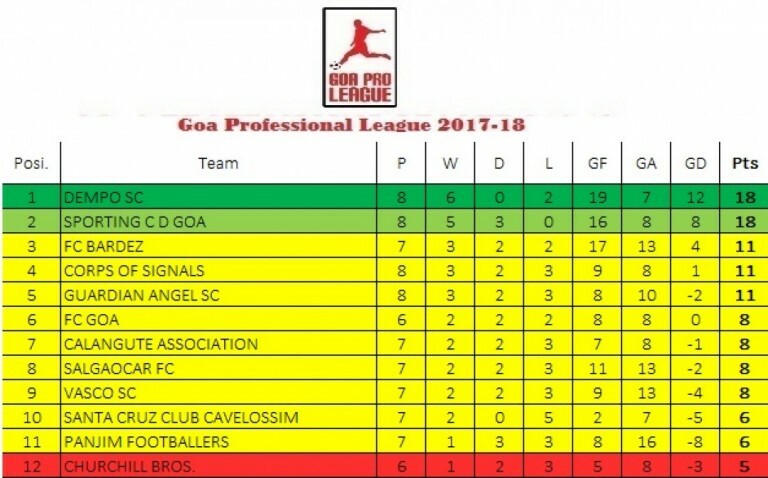 Dempo Sports Club regained the top spot as they downed Guardian Angel Sports Club 2-0 in the Goa Professional League match played at Duler Stadium earlier today. Dempo were in the fantastic form as they had won five out of Seven matches played. Their recent win was against Calangute Association. Whereas, Angels had experienced mixed, winning three, drawing two and losing two. They had recently drawn with league leader Sporting Clube de Goa in the previous round match. Dempo coach was forced to make changes to his side as Beevan D’Mello and Velti Cruz were suspended due to double bookings in the last matches. 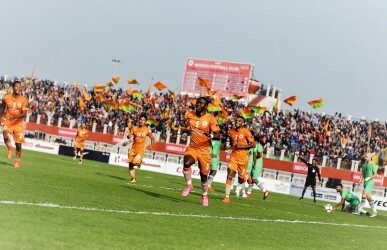 Jaison Vaz and Gaurish Naik replaced them in the starting XI, while defender Naveen Mendes also made into the cut as Mario Mascarenhas was benched. On the other hand, Angels coach Riston Rodrigues made only one change bringing in Clifton Dias in place of Rayman Fernandes. The match started with a possession football where both the side tried to keep the ball but it was Dempo who first looked at the goal when Yogesh Kadam snatched the ball from the rival defender and tried his luck from the distance only to see it go wide by few inches. However, in the 22nd minutes, the Golden Eagles surged ahead when Angels keeper Ram Sroop tried to clear Gaurish’s long ball to Kapil but the clearance hit the Dempo winger before finishing it into the goal making it 1-0 for Dempo. Ten minutes later, Kapil had an opportunity to double their lead as the winger made an individual effort from the halfway line and shot on the goal from inside the box but keeper ram brilliantly blocked it for a corner. Angels also had a golden opportunity to equalise in the 42nd minutes when Dempo centre-back Mathew Gonsalves made an error to clear the ball, taking advantage of the same, Joval Fernandes made a swift run in the box but Dempo keeper Agnelo Gomes brilliantly tipped his powerful shot for a corner. From the resulting corner, Sanwil D’Costa saw his header miss the target narrowly. The second half saw Dempo adding one more to their tally in the 57th minutes when substitute Suraj Hadkonkar tried to find Kapil in the box with a fine cross but Alson Fernandes’ interception beat the keeper and finished in the net making it 2-0 for the North Goan club. 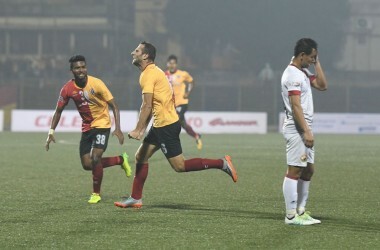 At the other end, Angels once again wasted another chance to reduce their margin when Clifton failed to connect from close, off Nicholas Rodrigues well-taken corner, while Dempo also wasted a chance to further inflate their lead as Kapil headed wide from close off Yogesh Kadam’s inch-perfect cross. Later part of the match witnessed, Angels trying hard to get back into the match but it was too late for the Curchorem side as Dempo defence line led by Mathew along with Shallum Pires, Naveen and Nickson Castanha gave no space for Angels forwards. With this win, Dempo once again regain their top spot with 18 points from eight matches, while Angels have 11 points from the same number of outings.